The domain within your query sequence starts at position 1 and ends at position 41; the E-value for the CysPc domain shown below is 1e-19. Some of the required catalytic sites were not detected in this domain. It is probably inactive! Check the literature (PubMed 95361909 ) for details. 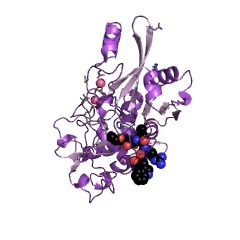 Calpain-like thiol protease family (peptidase family C2). 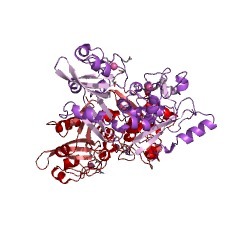 Calcium activated neutral protease (large subunit). 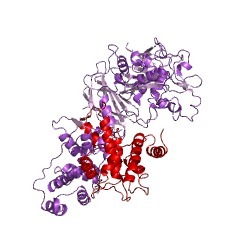 This group of cysteine peptidases belong to the MEROPS peptidase family C2 (calpain family, clan CA). 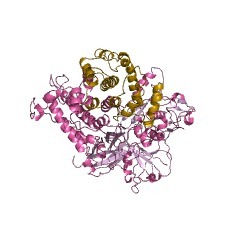 A type example is calpain, which is an intracellular protease involved in many important cellular functions that are regulated by calcium [(PUBMED:2539381),(PUBMED:11517928)]. 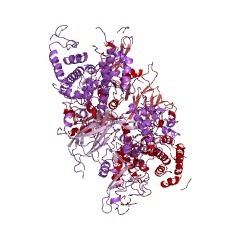 The protein is a complex of 2 polypeptide chains (light and heavy), with eleven known active peptidases in humans and two non-peptidase homologues known as calpamodulin and androglobin [(PUBMED:21864727)]. These include a highly calcium-sensitive (i.e., micro-molar range) form known as mu-calpain, mu-CANP or calpain I; a form sensitive to calcium in the milli-molar range, known as m-calpain, m-CANP or calpain II; and a third form, known as p94, which is found in skeletal muscle only [(PUBMED:2555341)]. 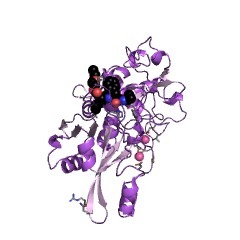 Active site domain IIb. Domain 2 shows low levels of sequence similarity to papain; although the catalytic His has not been located by biochemical means, it is likely that calpain and papain are related [(PUBMED:7845226)]. 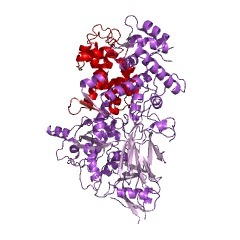 Domain IV, which resembles the penta EF-hand family of polypeptides, binds calcium and regulates activity [(PUBMED:7845226)]. 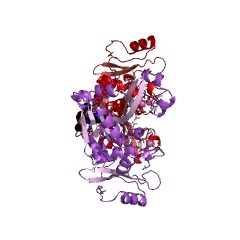 Ca2+-binding causes a rearrangement of the protein backbone, the net effect of which is that a Trp side chain, which acts as a wedge between catalytic domains IIa and IIb in the apo state, moves away from the active site cleft allowing for the proper formation of the catalytic triad [(PUBMED:11914728)]. Calpain-like mRNAs have been identified in other organisms including bacteria, but the molecules encoded by these mRNAs have not been isolated, so little is known about their properties. 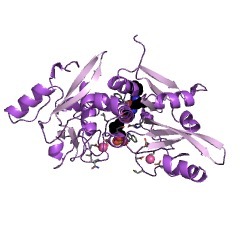 How calpain activity is regulated in these organisms cells is still unclear In metazoans, the activity of calpain is controlled by a single proteinase inhibitor, calpastatin (IPR001259). 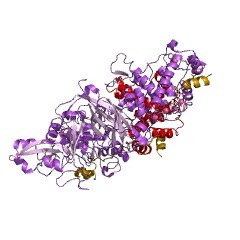 The calpastatin gene can produce eight or more calpastatin polypeptides ranging from 17 to 85 kDa by use of different promoters and alternative splicing events. The physiological significance of these different calpastatins is unclear, although all bind to three different places on the calpain molecule; binding to at least two of the sites is Ca2+ dependent. The calpains ostensibly participate in a variety of cellular processes including remodelling of cytoskeletal/membrane attachments, different signal transduction pathways, and apoptosis. Deregulated calpain activity following loss of Ca2+ homeostasis results in tissue damage in response to events such as myocardial infarcts, stroke, and brain trauma [(PUBMED:12843408)]. Calpains are a family of cytosolic cysteine proteinases. 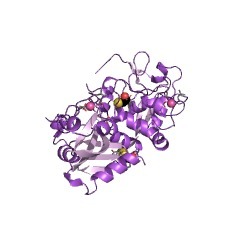 Members of the calpain family are believed to function in various biological processes, including integrin-mediated cell migration, cytoskeletal remodeling, cell differentiation and apoptosis [(PUBMED:11854009), (PUBMED:11950589)]. 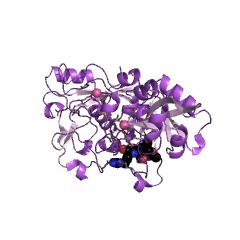 The calpain family includes numerous members from C. elegans to mammals and with homologues in yeast and bacteria. 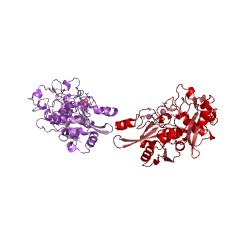 The best characterised members are the m- and mu-calpains, both proteins are heterodimer composed of a large catalytic subunit and a small regulatory subunit. The large subunit comprises four domains (dI-dIV) while the small subunit has two domains (dV-dVI). 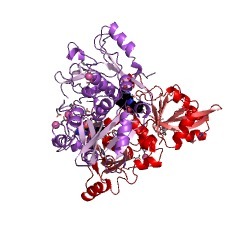 Domain dI is a short region cleaved by autolysis, dII is the catalytic core, dIII is a C2-like domain, dIV consists of five calcium binding EF-hand motifs [(PUBMED:11950589)]. 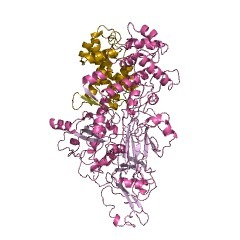 The crystal structure of calpain has been solved [(PUBMED:10601010), (PUBMED:11893336)]. 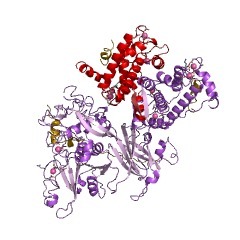 The catalytic region consists of two distinct structural domains (dIIa and dIIb). dIIa contains a central helix flanked on three faces by a cluster of alpha-helices and is entirely unrelated to the corresponding domain in the typical thiol proteinases. 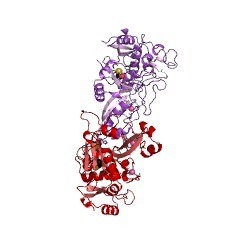 The fold of dIIb is similar to the corresponding domain in other cysteine proteinases and contains two three-stranded anti-parallel beta-sheets. 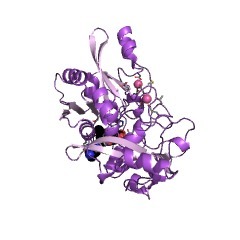 The catalytic triad residues (C,H,N) are located in dIIa and dIIb. 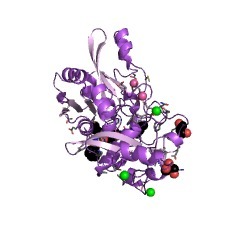 The activation of the domain is dependent on the binding of two calcium atoms in two non EF-hand calcium binding sites located in the catalytic core, one close to the Cys active site in dIIa and one at the end of dIIb. Calcium-binding induced conformational changes in the catalytic domain which align the active site [(PUBMED:11893336)][(PUBMED:11914728)]. The profile covers the whole catalytic domain. There are 11818 CysPc domains in 11784 proteins in SMART's nrdb database. Taxonomic distribution of proteins containing CysPc domain. This tree includes only several representative species. The complete taxonomic breakdown of all proteins with CysPc domain is also avaliable. Click on the protein counts, or double click on taxonomic names to display all proteins containing CysPc domain in the selected taxonomic class. SwissProt sequences and OMIM curated human diseases associated with missense mutations within the CysPc domain. This information is based on mapping of SMART genomic protein database to KEGG orthologous groups. Percentage points are related to the number of proteins with CysPc domain which could be assigned to a KEGG orthologous group, and not all proteins containing CysPc domain. Please note that proteins can be included in multiple pathways, ie. the numbers above will not always add up to 100%. 2g8j Calpain 1 proteolytic core in complex with SNJ-1945, a alpha-ketoamide-type inhibitor. 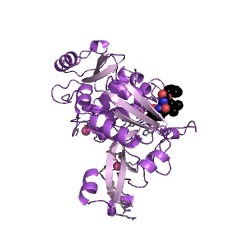 2nqg Calpain 1 proteolytic core inactivated by WR18(S,S), an epoxysuccinyl-type inhibitor. 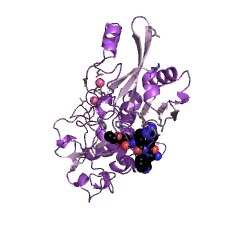 2nqi Calpain 1 proteolytic core inactivated by WR13(R,R), an epoxysuccinyl-type inhibitor.